We knew it would happen sooner or later; We’ve been talking about it for awhile. THE GOOD NEWS IS: We are ready and you can be too. THIS IS WHAT WE KNOW: The number of mobile Internet users is exploding! Mobile users are searching local businesses now, more than ever before. There are about 1.5 billion mobile searches in Google, daily, and that means: billions of dollars will be made from mobile marketing. Everyone in business today needs a mobile website; that is-to stay connected in the changing landscape of internet search. In 2015, we will see a tipping point of mobile searches; at the stage where the majority of spending, organic traffic and paid clicks will come from smartphones. HERE’S THE SCOOP: Starting on April 21st, because of the huge and rapid growth in mobile searches, Google is changing their search algorithms to reflect mobile-optimized websites. They are also expanding their use of mobile friendliness as a ranking signal. This change will have a significant impact on where websites are ranked when searching Google on a mobile device. This change will affect mobile searches in every language, in every country, all over the world. WHAT IT MEANS: Google wants their searchers to find high-quality websites that are designed and optimized for their mobile devices. Google’s NEW ranking factors will determine if your client’s site is considered “mobile friendly” and their mobile friendliness will now decide where they rank in the search results on all smartphones. Websites that are not mobile-optimized will be penalized on Google’s mobile searches. That’s the terror of the Mobile Apocalypse! THE BAD NEWS IS: If your clients are not mobile-ready: They can lose anywhere between 30% to 50 % of their organic search traffic. That’s alot, and YOU don’t want that. Tech Crunch did a survey and found out just how widespread this issue is; with almost half of websites failing the mobile-friendly test. That means that even with awesome SEO and strong brand awareness big companies will still need to be mobile-optimized simply because of the powerful shift towards mobile devices. Just imagine what can happen to the little guys! HERE’S YOUR SOLUTION: Google will be favoring mobile-friendly sites over non-mobile friendly sites, starting on April 21st. Don’t allow your client’s site to get lost on the third or fourth page, and don’t let these changes get you down because it has never been easier to build and sell mobile websites! Now more than ever before, it is important to have mobile optimized websites and we’ve devised the perfect 7 DAY FOOL-PROOF FREE TRIAL to allow you to build mobile websites that are Google friendly and will rank well in mobile search results. 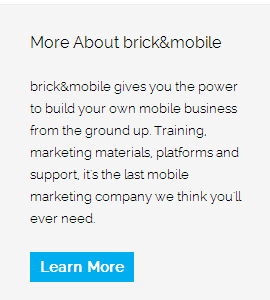 Mobile websites for local businesses are no longer a “nice to have”: Starting April 21, 2015 it’s a MUST. YOU SAVED THE DAY. The Google gods will shine on you and your clients will thank you for making sure that they are protected. 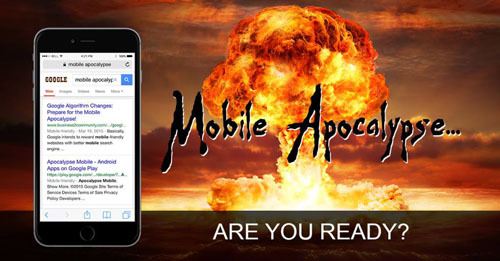 Now that you know what the Mobile Apocalypse is, and how it will affect your client’s business, don’t miss Part 2 where we will reveal all of the tools that you will need to survive!